Pocket doors are a really great space saver and they’ve become extremely popular with today’s floor plans. Pocket doors slide on an overhead rail system that allows the door to be slid into a pocket in the adjacent wall. 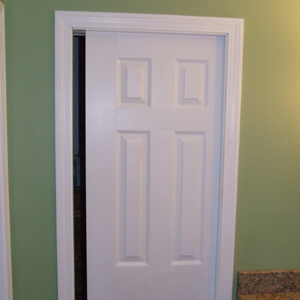 Pocket doors can even match all the other doors in your home and appear to be a regular door when it’s closed. Installing a pocket door isn’t very difficult but it does require some different trim details. The trick to pocket doors is trimming the jam on the top and pocket side. 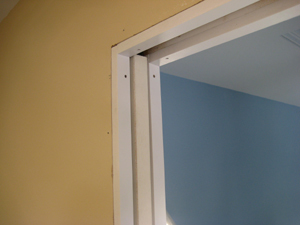 Pocket door frames consist of both metal and wood components. One each room side of the pocket side of the frame there is a piece of 1x material that the drywall can be screwed to. This is also the only wood that’s available to attach the jambs and casing to. As you can see in the next photo the pocket side jamb is trimmed out with pieces of 1x screwed to the 1x frame material. 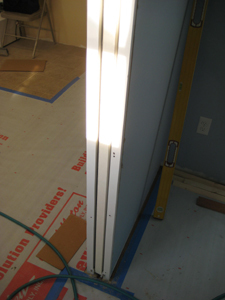 The first step is to rip a piece of 1x trim material to the depth of the frame plus drywall. Typically this is 1-1/4″ wide but it’s best to measure and check the dimension. Next I like to screw the jamb material to the pocket door frame instead of nailing it. I pre-drill the trim and use a small headed trim screw. On the other side you just install a full width piece of jamb trim from floor to top. If you want you can install a fake jamb stop to mimic a traditional hung door. Once the jambs are installed you can install casing in the same fashion as the regular doors. Just be careful not to use long fasteners as you’ll hit the door in the pocket. I recommend glueing the trim on and using short brad nails. INSTALLING JAMBS IN THIS MANNER REQUIRES THE REMOVAL OF BOTH CASING AND JAMB TO SERVICE THE DOOR. THE CORRECT WAY IS TO INSTALL THE CASING WITH THE INSIDE EDGE FLUSH WITH THE ROUGH POCKET DOOR FRAME AND THEN USING STOP MOLDING ON THE INSIDE EDGE OF THE JAMB, WHEREAS THE CASING AND STOP MOLDING JUST MEET AT THEIR INSIDE EDGES. WHEN INSTALLED THIS WAY ALL THATS REQUIRED TO SERVICE THE DOOR IS TO REMOVE JUST THE STOP MOLDING. @ Tom – This is not true. The only thing that you need to service the door in this situation is to remove one small piece of jamb on the top. We install that piece with trim screws which makes it very easy to remove. Not to make problems but I agree with Todd.I’m a finish carpenter from Ontario canada. The proper way to finish a pocket door is to jamb out the frames. Yes this does make it harder to service to door, so extra care should be taken when installing the door. Question, the Johnson pocket door frame installed by the framing carpenters has a double 1-by piece at the top by the guide rail. Is the second one to be removed? It appears to be stapled on and is lower than the rail itself. Also in the area in which the rollers slide in, is there any way to put a block from one side to the other to avoid seeing the metal bracket that is visible when the door is open? @ Roy – Any chance you could email me some photos? If there’s something stapled below the upper guide rail then it’s probably temporary especially if it’s in the way of the door. When the door is open you will always be able to look up into the “header” and see the track, or am I mis-understanding your question? Is it possible to get instructions how to do this in Spanish? Although, we have this in our home in USA…We are building a home now in CHile, and they are not familiar with this concept. @ Gina – I wish I could help out but my Spanish is limited to saying hello. Maybe a reader knows Spanish well enough to translate. Best of luck. I like Todd install ripped 1x, anywhere from 1 3/8″ to 1 1/2″, on the top and back side jamb but on the inside use 3 trim screws and do not fasten the casing to the jamb. Access to the release mechanism is swift and painless. Also what is not mentioned is that where the door hits the bumper inside the wall, I fasten a piece of 1x to the door edge to keep the door from dropping to far back into the pocket frame. Hi!! Todd thank for you article!! I have a question about pocket doors. I am remodeling my bathroom, and I want to replace the existing door to a pocket door since the wall is already there, do I have remove the drywall in both sides in order to install the pocket door? I was going to just remove the wall that is already damage (inside the bathroom) only. Pocket doors take up twice the width of the door. So if you have a 36″ wide pocket door you’ll need to have a rough opening that is 36″ times two plus another two inches (typically). So that means you’ll need to tear apart the wall for 74″ plus or minus. This is required to install the actual frame for the pocket door. So…to answer your question…yes you’ll have to open both sides of the wall. Justin – Not sure I understand completely what you’re trying to do. Can you email me a picture? todd “at” frontstepsmedia “dot” com. Hello, do you think it would be a good idea to add door check as well as jamb to both decorate and guide the door better?